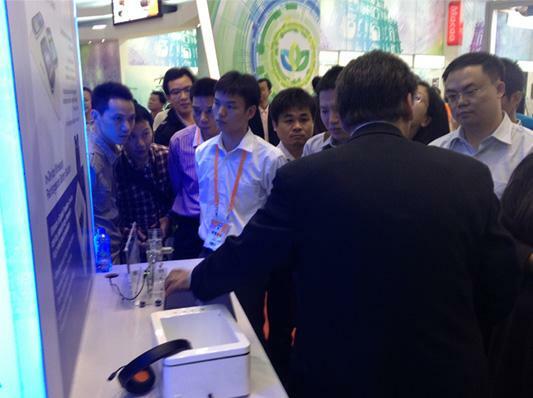 PowerbyProxi, (www.powerbyproxi.com), developer of the world’s most advanced and safest wireless power system, is attracting strong interest in its In-Device Wirelessly Rechargeable Battery Solution at the China Hi-Tech Fair which runs until November 21, 2012. The breakthrough technology enables all devices using AA batteries to remain charged eliminating the cost of replacing batteries and the hassle of removing rechargeable batteries to place them in an external charger. “Keeping devices, like TV remotes, cameras and video game controllers, charged throughout their lifespan usually requires purchasing dozens of batteries,” said Greg Cross, Executive Chairman of PowerbyProxi. PowerbyProxi’s advanced In-Device Wirelessly Rechargeable Battery Solution, comprising AA wireless batteries and a charging unit, works with any device powered by AA batteries instantly transforming it into a wirelessly rechargeable device. When batteries are low on charge, simply place the device into the In-Device charging unit. This “In-Device Charging” illustrates PowerbyProxi’s innovation in wireless power and miniaturization. PowerbyProxi’s solution delivers major advances in wireless power including the world’s smallest wireless power receivers, integrated directly into the existing form factor of AA batteries. It also houses a unique wireless transmitter design to provide for unprecedented three-dimensional charging with full spatial freedom (the device can be placed in any position and orientation), as well as the ability to charge multiple devices simultaneously. This technology enables consumer electronics OEMs and ODMs and battery suppliers to develop a system capable of re-charging millions of everyday consumer devices completely wirelessly. PowerbyProxi will be doing live demonstrations of the In-Device Wirelessly Rechargeable Battery Solution at booth 6 in Hall 9. PowerbyProxi has developed the world’s most advanced and safest wireless power system. We give consumer electronics and industrial product suppliers the freedom to wirelessly transfer efficient power in the most challenging applications: from less than 1 Watt miniaturized receiver inside a AA battery to a mission critical solution in the demanding and hostile environment of a wind turbine control system requiring Kilowatts of power. PowerbyProxi has shipped products to over 30 customers worldwide solving real life problems in over 50 working applications and built its deep technical know-how by initially focusing on complex industrial applications. Our leadership in consumer electronics delivers solutions for smartphones, tablets, and other devices using AA batteries to be recharged with full spatial freedom, regardless of position or orientation, and many devices recharged simultaneously. We have also created the first commercial wireless recharging system capable of 3D power transfer, regardless of how the device is positioned in the recharging unit. PowerbyProxi is a spin-out of the University of Auckland’s world-leading engineering department and holds an unrivaled patent portfolio with 125 patents issued worldwide.